Subsequently operating under its slogan, “America’s Diner is always open,” they have not disappointed. Offering breakfast, lunch, and dinner 24-7-365, Denny’s became a favorite eating joint for many individuals, especially on holidays. However, in 1988, Denny’s restaurants all across the country did something they’d never done before: They closed. That’s right, for the first time in their 35 years of operation, the chain of restaurants closed their doors and gave their 60,000+ employees a paid day off. There was one problem. Owing to the fact that they had never closed before, of their 1,221 operating locations at the time, 700 of them didn’t have locks on the doors. And that’s not all. Many of the buildings that had locks had no keys. What’s the rule? If you haven’t used something in six months, a year, five years get rid of it? Apparently for some employees, the same rule applied for the restaurant keys. So, in addition to having to install locks on more than half of their buildings for the one day of closing, they also had to get locksmiths to make keys for many of the doors that already had locks, but nobody knew where the keys were. With all the locks installed and keys made, all but six of their locations across the United States closed starting at 7 pm Christmas Eve and through Christmas Day of 1988. Apparently they only deserved it once, as this was something Denny’s never did again. You see, while it’s great to give employees Christmas off, Christmas is one of Denny’s busiest days of the year, with many people making dining at Denny’s part of their Christmas day tradition. In fact, it isn’t unheard of for an individual branch to serve up to 1,500 customers on Christmas day alone, contributing to well over a million customers served across the nation at Denny’s restaurants on Christmas. So while this act of kindness by upper management resulted in a flood of gratitude from employees, perhaps the major hit to their bottom line made corporate rethink the decision for subsequent years. Whatever the case, if Denny’s ever does decide to close again en masse, it will be interesting to see if they kept better track of their keys this time. 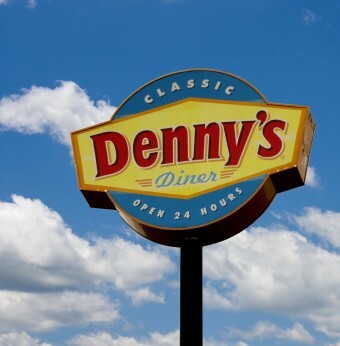 Denny’s was originally named “Danny’s Doughnuts” simply because the founders, Richard Jezak and Harold Butler, thought that “Danny’s” flowed well with “Doughnuts”. In 1959, they decided to change the name to “Denny’s” because customers began confusing their restaurants with the competing “Coffee Dan’s”. You left out an important detail. The management of Denny’s doesn’t -require- workers to work on any Christmas after 1988. Each store has the option of “If enough workers -want- to work in Christmas, then they may do so”. Since Christmas is the biggest tipping day of the year, they have no shortage of workers who wanted to work. The Denny’s in my area was certainly packed up this past Christmas. There’s about 18 or more fast-food, quick-serve or regular dining eateries on a half-mile stretch of Lincoln Highway there, including my diner-style store. Every one was closed except Denny’s and McDonalds.